The twin terror attacks on two mosques during Friday prayer at Christchurch, New Zealand, caused the deaths of 50 people. The attacker, Brenton Tarrant, made visits to a number of countries such as Turkey, Egypt, Greece, Serbia, Montenegro, Bosnia and Herzegovina, Croatia, Romania, and Bulgaria. The areas the terrorist visited are pretty much former lands of the Ottoman Empire. The attacker gave strong hate messages. Not only his written statement, but also his assault weapons were full of symbolic names, places, and dates. Amongst such names, one can count an assassin of Ottoman Sultan Murad I in 1389, two military commanders who fought against the Ottoman Empire respectively in 1571 in Cyprus and in 1683 in Vienna, an Albanian rebel leader against the Ottomans in the 15th century, and so on. Both the statement and the weapon are full of Islamophobic, and naturally, Turkophobic messages. The terrorist’s hate messages were not just about history but also glorified recent killings of Muslims. While critical news outlets and popular TV shows like Family Guy pointed out the hypocrisy, mainstream media has continued its double standards. After all, terrorism was destined to be a Muslim problem. It seems like the attacker was well aware of the nature of such recent attacks against Muslims living in the West, much more aware than the mainstream coverage of such attacks in the West. For so long, the terrorism narrative has been tied to Muslims. The religion of the attacker has almost become a definitive attribute of the act. If the attacker is Muslim, it is called an act of terrorism with quick conclusions whereas if the attacker is not Muslim, it is often described as an act of a weakened person due to mental issues. 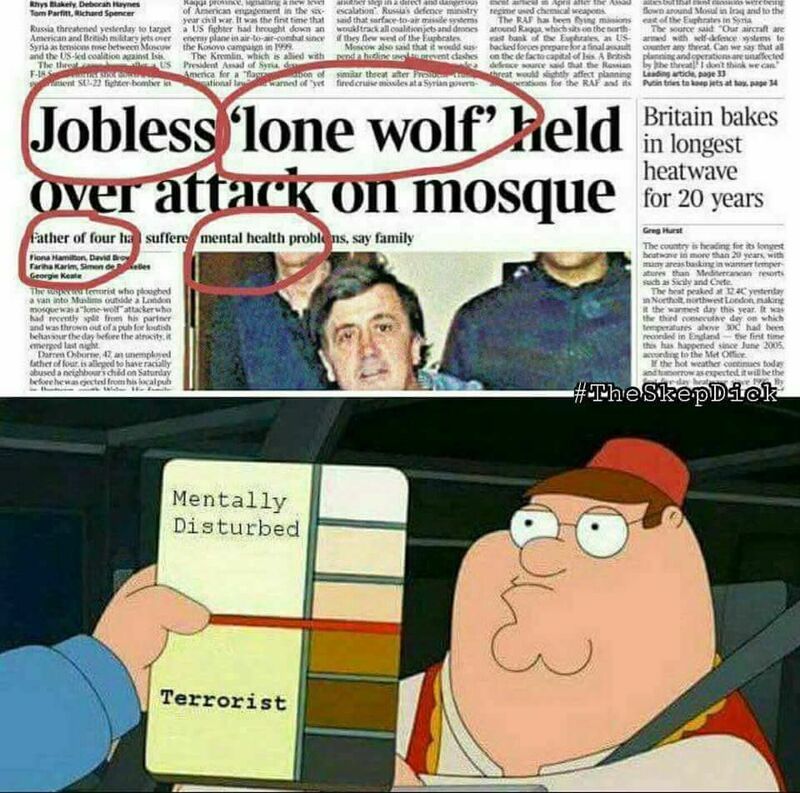 While critical news outlets and popular TV shows like Family Guy pointed out this hypocrisy, mainstream media has continued its double standards. After all, terrorism was destined to be a Muslim problem as all the atrocities committed by the U.S., Israel, and many other parties have been whitewashed under the umbrella of the fight against terror. As Muslims have been the usual suspects of terrorism, the real danger has silently grown. First, right-wing populism defined Muslims living in the West as dangerous aliens. And then the white man decided to carry his burden by fighting against the brown man. A series of hate crimes and terror acts have been carried out in the West, sometimes with quite sophisticated organizational networks. Nevertheless, they were neither called terrorists nor did their actions face strong preventive and deterring counter-measures. This bias against Muslims and this permissive environment enabled the Islamophobic and/or supremacist terrorists to carry out their acts. In certain cases, they could carry out a terror campaign for long years without serious media coverage and state counterterrorism policies against them. The National Socialist Underground, for example, killed ten people over 8 years in such a permissive environment in Germany. The lesson of the New Zealand attack is that the West got it all wrong. On the one hand, the counterterrorism measures of the West have often easily tolerated violations against Muslims, in many instances, even the killing of Muslims as collateral damage. Further, the rhetoric that equates terrorism with and only with Muslims justified killing Muslims in the eyes of so-called troubled minds. If one lesson is to be taken from the New Zealand attacks, it is that the West should take responsibility for today’s terrorism. It is not Islamic terrorism that threatens the world today, it is the Western policies that terrorize the entire Muslim geography. And now, random people have begun to organize to continue the mission of killing Muslims as it has proven time after time that the Muslim life does not cost much to the killers. If there is one solution to this problem, it starts with recognizing terrorism not as an exclusively Muslim crime.